When it comes to insincere friend gestures, a generic birthday wish on someone’s Facebook wall probably falls right below re-gifting and right above getting a drink for you at the bar but still putting it on your tab. It’s not that it’s not nice, it’s just that scrawling a generic “Happy Birthday!” to mark the occasion doesn’t necessarily feel thoughtful or creative. The amount of effort feels…well, minimal. And it turns out I’m right! Facebook’s notifications will actually text you when a friend’s birthday is that day, and you can simply reply with the number ‘1’ to send your regards. After did some digging and there are some finer points to the mechanics of the robo-birthday wish: Birthday reminders are actually included content in mobile push notifications, and Facebook says its been rolling this feature out to its user base over the last year or so. 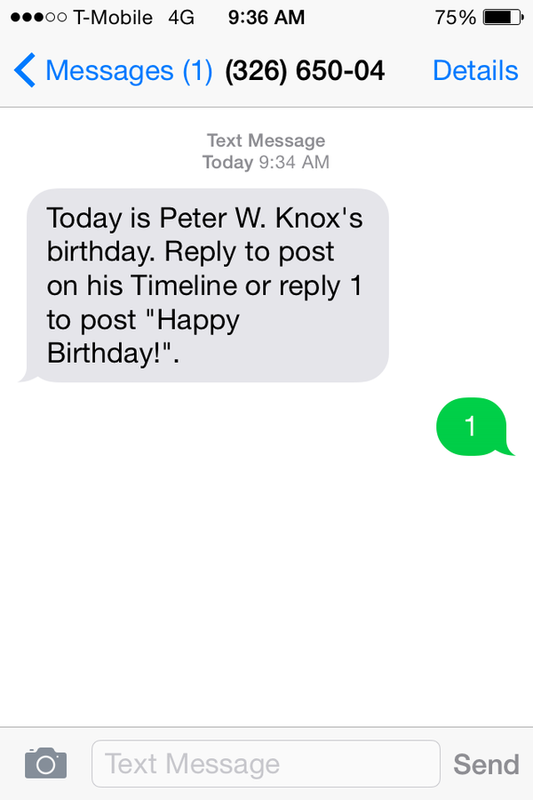 Those who get their Facebook information via SMS (non-smartphone users or those who just prefer to keep the Facebook app off their phone) will get that friendly text and a reminder to reply every time a connection has a birthday. It sounds like it’s annoying to everyone by all accounts, so stay authentic people! I suggest sending friends a GIF of kittens in a basket or a dog dancing — they’ll really feel the sentiment.